Objective: Anterior cervical arthroplasty (ACA) is the gold standard surgery in severe or unresponsive cases of cervical disc herniation, uncarthrosis, and foraminal stenosis. The aim of this study is to establish the impact and outcome evaluations of managing the patients operated for cervical arthroplasty by the intersomatic porous alumina ceramic cervical cages (PACC). The authors describe their experience in the area to allow the comparison of effectiveness of ceramic cages versus other interbody fusion cages. Materials and Methods: Between April 2015 and September 2018, we operated 118 for ACA by using PACC. Among them, 52 were female and 66 were male, with an average age of 46.78 years. Results: The mean symptoms duration was 14.1 months. The most frequent level of the disorder was C5–C6 followed by C6–C7 level. Mean follow-up was 3.3 years. The Neck Disability Index (NDI) and the visual analog scale (VAS) were used to evaluate the patients status. No significant differences were observed between our results and literature data regarding operative time, duration of hospitalization, and NDI; however, we observed a shorter period and higher rate of bony fusion. Conclusion: The results from the present study corroborate that implementing of PACC is a good alternative treatment for the patient operated by ACA for cervical disc herniation or foraminal cervical stenosis. Anterior cervical discectomy (ACD) with intersomatic graft is the gold standard in the treatment of cervical disc herniation. ACD without graft would be performed in the first half of the 20th century.,, Although the latter has a few supporters up to now,, since the initial description, most surgeons perform ACD with interbody fusion– first by bone graft and after that by allograft bone and different interbody cages-with or without instrumentation.,,,,,,,,,,,,, As a matter of fact, according to several studies, ACD without intersomatic graft would lead to kyphosis, upper-crossed syndrome, and cervicobrachial neuralgia.,,,,,,,, Since 1990, cervical cages under several categories and materials have been marked. Different authors shared their experiences in significant numbers of studies. The purpose of this study is to introduce our experience in ACD with intersomatic graft by the porous alumina ceramic cervical cages (PACC) and to compare our results with those of the other authors. Between April 2015 and August 2018, we operated 118 patients for ACD with graft by PACC. PACC are based on the natural mineral and designed specifically to medical use. The mean age of the patients was 46.78 (27–71) with an average duration of symptoms of 6.45 months (2 months– 3 years). The mean symptoms duration was 14.1 months. We operated 66 male patients and 52 female patients (female/male ratio = 1/1, 27). A total of 59 patients were operated at C5–C6, 38 patients at C6–C7, 24 patients at C4–C5, five patients at C3–C4, and four patients at C7–D1. Twelve patients had been operated at two levels. All patients had cervicobrachial neuralgia (radiculalgia and cervical pain). The patient with cervical myelopathy were excluded from the study. [Table 1] demonstrates the patient's baseline and characteristics. The length of hospital stay was one night. Patients wear the cervical collar for few days after surgery used for reducing pain and avoiding too much cervical movement. All patients underwent X-ray imaging of the cervical spine on the day after surgery, week 6, months 6, year 1, and year 2 postoperatively. They were examined clinically at 6 and 12 weeks, 6 months, one and 2 years postoperatively and evaluated with a visual analog scale (VAS) ranging from 0 (no pain) to 10 (worst pain imaginable) and with the Neck Disability Index (NDI), which ranges from 0 to 50 (0%–100%). The mean duration of follow-up was 3.3 years. All patients had anteroposterior and lateral cervical spine X-rays 6 weeks, 6 months, and 1 year after surgery. The results were evaluated for pain with VAS, for ability and to manage in everyday life by the NDI and for bone fusion by the X-ray. [Table 2] demonstrates preoperative and postoperative evaluation of patients by VAS and NDI. The radiological results were evaluated by the lateral radiographs. The fusion was defined by the disappearance of the border between vertebral endplates and implant borders [Figure 1]. The fusion was obtained in 107 patients at 6 months and in 112 patients at 1 year [Table 3]. 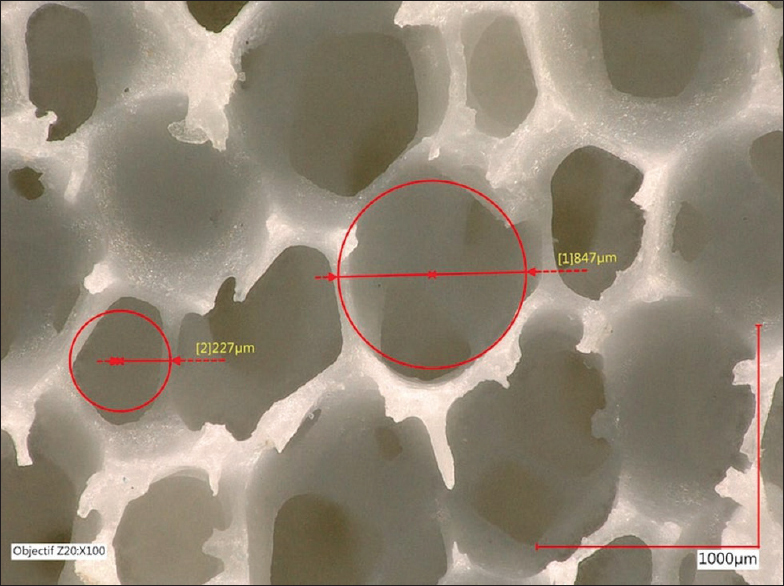 The interest of PACC lies in biomaterial micro-porous substitutes which reproduces the trabecular pattern bone. It mimics the porosity of cancellous bone and has approximately the same diameter. The average diameter of cancellous bone is 639 μm, and the average diameter of PACC is 591 μm [Figure 2]. This porous structure allows ingrowth of the bone cells and blood vessels and secondary osteogenesis., The material has an open porosity varying from 200 to 600 μm. Medium degree of mechanical strength varies from 20 MPa to 60 MPa. It is also chemically inert., In our series, no infection was recognized. Finiels using the same implant in 61 patients reported any complication of this type and this, notwithstanding the mean rate of infection is of 0.07%–1.6% in the medical literature.,,, Fusion rate is an important criterion for a good outcome. It varies from 71.4% to 92.1% for single-disc implant without instrumentation.,,,,,, Fusion is considered as no evidence of radiolucency between the vertebral bodies and implant and continuous trabecular bone bridges in the disc space. In our series, we achieved a fusion rate of 90.67% in 6 months and 94.92% in 1 year after surgery [Figure 1]. These results are widely more than the average rate reported in most articles. As [Table 2] shows, there was an important improvement on the VAS and NDI. Six months after surgery, mean score of NDI was reduced to 19.52, and 1 year after surgery to 20.21 while before surgery it was 64.12. These results are comparable with the literature data.,,,, A similar situation exists with mean score of VAS. Average pain intensity was 7.01 in the preoperative period. It was reduced to 3.02 in 3 months, to 1.95 in 6 months, and to 1.99 in 1 year after surgery [Table 3]. A total of 97 patients were on working age. Among them, 81 patients were on sick-leave before surgery. Sixty-three patients (77.78%) returned to work 1 month postoperatively and among the remaining 18 patients, 12 returned to work 2 months after surgery. All in all, 2 months after surgery, 75 patients (92%, 59%) were able to work in their profession. PACC is an autologous bone implant in bioceramic. It is inert and nonabsorbable and allows a good, rapid, and sustainable bone fusion. We believe that, based on these attributes, PACC is a promising alternative for used implants in ACD with graft. Denaro V, Di Martino A. Cervical spine surgery: An historical perspective. Clin Orthop Relat Res 2011;469:639-48. Murphy MG, Gado M. Anterior cervical discectomy without interbody bone graft. J Neurosurg 1972;37:71-4. Konduru S, Findlay G. Anterior cervical discectomy: To graft or not to graft? Br J Neurosurg 2009;23:99-103.
de Rooij JD, Gadjradj PS, Soria van Hoeve JS, Harhangi BS. Anterior cervical discectomy without fusion for a symptomatic cervical disk herniation. Acta Neurochir (Wien) 2017;159:1283-7. Mayo BC, Massel DH, Bohl DD, Long WW, Modi KD, Singh K, et al. Anterior cervical discectomy and fusion: The surgical learning curve. Spine (Phila Pa 1976) 2016;41:1580-5. Cabraja M, Oezdemir S, Koeppen D, Kroppenstedt S. Anterior cervical discectomy and fusion: Comparison of titanium and polyetheretherketone cages. BMC Musculoskelet Disord 2012;13:172. Hacker RJ. A randomized prospective study of an anterior cervical interbody fusion device with a minimum of 2 years of follow-up results. J Neurosurg 2000;93:222-6. Cabraja M, Kroppenstedt S. Bone grafting and substitutes in spine surgery. J Neurosurg Sci 2012;56:87-95. Fernström U. Arthroplasty with intercorporal endoprothesis in herniated disc and in painful disc. Acta Chir Scand Suppl 1966;357:154-9. Schmieder K, Wolzik-Grossmann M, Pechlivanis I, Engelhardt M, Scholz M, Harders A, et al. Subsidence of the wing titanium cage after anterior cervical interbody fusion: 2-year follow-up study. 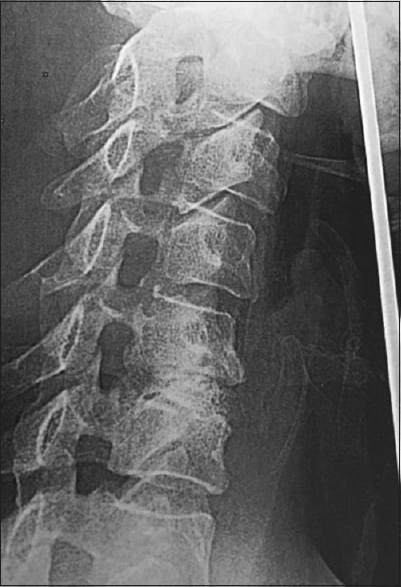 J Neurosurg Spine 2006;4:447-53. Abdallah A, Taha AM. Cages or plates for anterior interbody fusion for cervical radiculopathy: Single and double levels. Egypt Orthop J 2016;51:65-70. Salame K, Ouaknine GE, Razon N, Rochkind S. The use of carbon fiber cages in anterior cervical interbody fusion: Report of 100 cases. Neurosurg Focus 2002;12:E1. Smith MW, Romano DR, McEntire BJ, Bal BS. A single center retrospective clinical evaluation of anterior cervical discectomy and fusion comparing allograft spacers to silicon nitride cages. J Spine Surg 2018;4:349-60. Findlay C, Ayis S, Demetriades AK. Total disc replacement versus anterior cervical discectomy and fusion. Bone Joint J 2018;100-B: 991-1001. Hauk L. Anterior cervical discectomy and fusion. AORN J 2018;108:P11-3. Moussa A, Tanzer M, Pasini D. Cervical fusion cage computationally optimized with porous architected titanium for minimized subsidence. J Mech Behav Biomed Mater 2018;85:134-51. Porchet F, Metcalf NH. Clinical outcomes with the prestige II cervical disc: Preliminary results from a prospective randomized clinical trial. Neurosurg Focus 2004;17:E6. Vital JM, Guérin P, Gille O, Pointillart V. Prothèses discales cervicales. Techniques Chirurgicales – Orthopédie-Traumatologie. Elsevier Masson SAS, Paris: EMC; 2011. p. 44-162. Finiels PJ. Intérêt des biocéramiques en Alumine Poreuse cellulaire en chirurgie rachidienne. Neurochirurgie 2004;50:630-8. Annaz B, Hing KA, Kayser M, Buckland T, Di Silvio L. Porosity variation in hydroxyapatite and osteoblast morphology: A scanning electron microscopy study. J Microsc 2004;215:100-10. Cedran M, Chartier T, Delage C, Paez C. Nouvelles biocéramiques en orthopédie. Maîtrise Orthop 1999;89:10-6. Ghobrial GM, Harrop JS, Sasso RC, Tannoury CA, Tannoury T, Smith ZA, et al. Anterior cervical infection: Presentation and incidence of an uncommon postoperative complication. Global Spine J 2017;7:12S-6S. Naderi S, Acar F, Mertol T. Is spinal instrumentation a risk factor for late-onset infection in cases of distant infection or surgery? Case report. Neurosurg Focus 2003;15:E15. Pechlivanis I, Thuring T, Brenke C, Seiz M, Thome C, Barth M, et al. Non-fusion rates in anterior cervical discectomy and implantation of empty polyetheretherketone cages. Spine (Phila Pa 1976) 2011;36:15-20. Fountas KN, Kapsalaki EZ, Smith BE, Nikolakakos LG, Richardson CH, Smisson HF, et al. Interobservational variation in determining fusion rates in anterior cervical discectomy and fusion procedures. Eur Spine J 2007;16:39-45. An HS, Simpson JM, Glover JM, Stephany J. Comparison between allograft plus demineralized bone matrix versus autograft in anterior cervical fusion. A prospective multicenter study. Spine (Phila Pa 1976) 1995;20:2211-6. Bolesta MJ, Rechtine GR 2nd, Chrin AM. One- and two-level anterior cervical discectomy and fusion: The effect of plate fixation. Spine J 2002;2:197-203. Cauthen JC, Kinard RE, Vogler JB, Jackson DE, DePaz OB, Hunter OL, et al. Outcome analysis of noninstrumented anterior cervical discectomy and interbody fusion in 348 patients. Spine (Phila Pa 1976) 1998;23:188-92. Gokaslan ZL, Cooper PR. Treatment of disc and ligamentous diseases of the cervical spine by the anterior approach. In: Youmans W, editor. Neurological Surgery. 4th ed. Philadelphia: W.B. Saunders; 1996. Kapetanakis S, Thomaidis T, Charitoudis G, Pavlidis P, Theodosiadis P, Gkasdaris G, et al. Single anterior cervical discectomy and fusion (ACDF) using self- locking stand-alone polyetheretherketone (PEEK) cage: Evaluation of pain and health-related quality of life. J Spine Surg 2017;3:312-22. Liu H, Yue L, Chen SL, Hu B, Li CD, Yi XD, et al. Anterior cervical discectomy and fusion to treat cervical spondylosis with sympathetic symptoms. Beijing Da Xue Xue Bao Yi Xue Ban 2018;50:347-51. Hessler C, Boysen K, Westphal M, Regelsberger J. Functional and radiological outcome after ACDF in 67 cases. Z Orthop Unfall 2011;149:683-7. Pazdernyik S, Sándor L, Elek P, Barzó P. Anterior cervical fusion on the lower cervical spine: Own clinical experience. Ideggyogy Sz 2010;63:25-37. Nohra G, Abi Lahoud G, Jabbour P, Salloum C, Rizk T, Samaha E, et al. Discectomie cervicale antérieure avec ou sans greffe dans les conflits radiculaires, résultats à long terme. Neurochirurgie 2003;49:571-8.